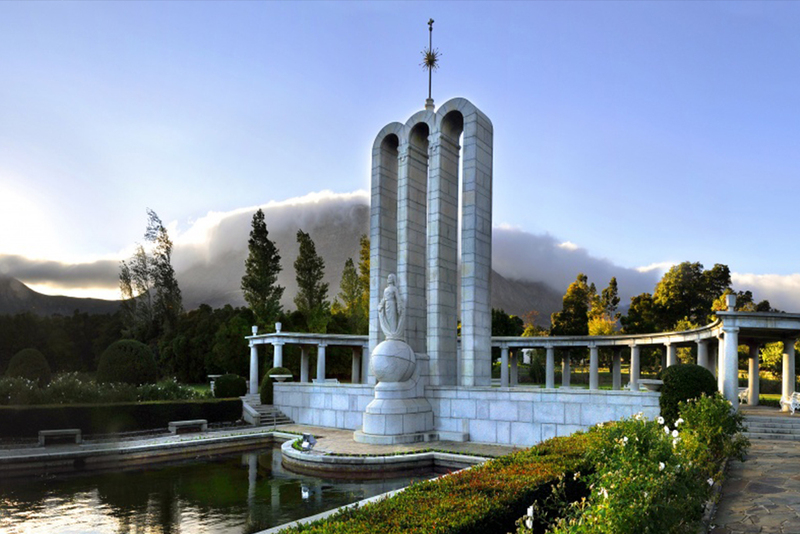 The Huguenot Memorial Monument in Franschhoek was inaugurated on April 17th, 1948. With its simplicity and elegance of line the monument displays a historic French character.The female figure, with the Bible in her right hand and broken chain in her left hand, personifies the spirit of religious freedom. The fleur-de-lis (French lily) on her robe represents a noble spirit and character. She discards the cloak of suppression to triumph above the earth globe in its own spiritual space. Her gaze is fixed on a majestic vision of coming things. On the portrayed Southernmost point of Africa to where the frail ships transported the Huguenots, the symbols of their religion (the Bible), art and culture (the harp), the agriculture and viticulture (the sheaf of corn and grape vine) and industry (spinning wheel) are portrayed. The three lofty arches is a symbol of the Holy Trinity. Above it the Sun of Righteousness shines, and above that the Cross as symbol of Christian faith is mounted. 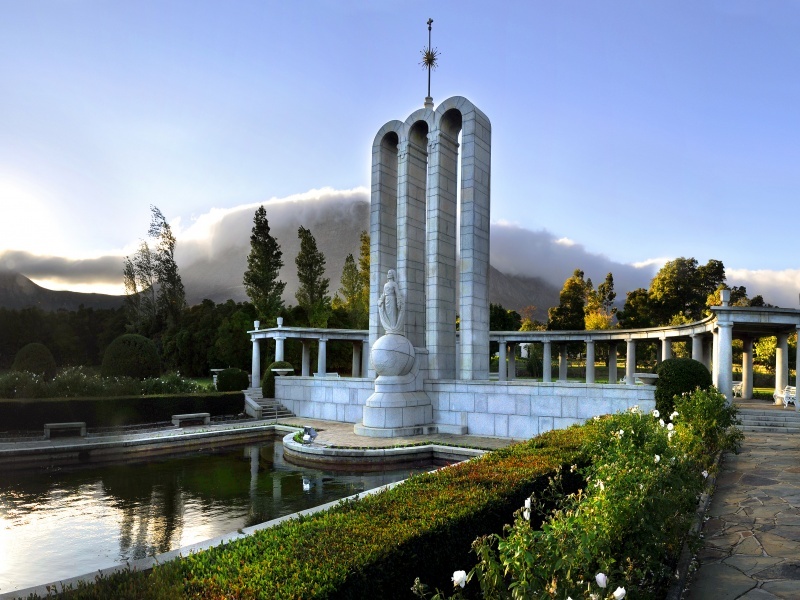 The water pond, reflecting the colonnade behind it, expresses the undisturbed tranquility of mind and spiritual peace the Huguenots experienced after much conflict and strife. The lawns by the monument can be used for events. 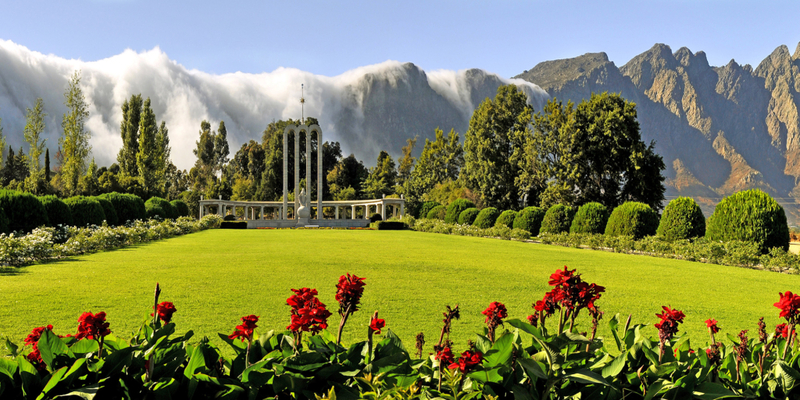 If you are looking for an outdoor venue that goes back in history, then the Franschhoek Monument is the ideal venue for you.